The Krupp last sold at Sotheby's on May 16th, 1968, for $305,000, to Elizabeth Taylor. The stone weighs 33.19 carats and is mounted in a ring. She wears it nearly every day and in every film since acquiring it; it was even animated into her special guest appearance on The Simpsons. Taylor is seen polishing her Academy Awards, we see her eye reflect, blinking, on the stone's facets. 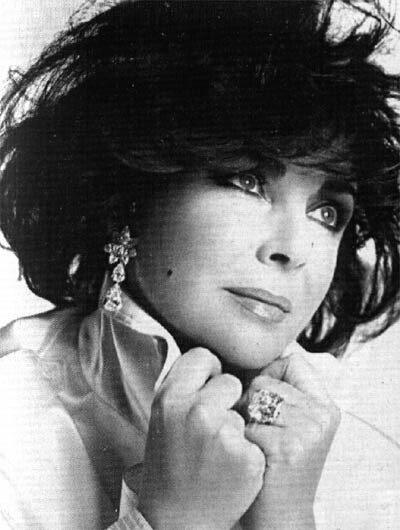 Elizabeth Taylor wearing the Krupp ring. Elizabeth Taylor also owned a 69.4-carat pear shaped, D-color, Interally Flawless diamond. It came up for auction at Sotheby's on October 23, 1969. At the sale, Cartier outbid Richard Burton who was bidding over the phone, but he later negotiated with them to the record breaking tune of $1,050,000 for the stone. When the stone changed hands, it was set in a ring. It was named the Taylor-Burton Diamond and mounted as a pendent on a $25,000 necklace by Harry Winston. There also was unprecedented publicity around this sale. In 1978, Elizabeth Taylor sold the stone, and the proceeds went to help build a hospital in Botswana, Africa. Sometime later that year Robert Mouawad purchased it. Elizabeth Taylor flashes the Krupp Diamond to a group of reporters. This is what it says in my volume of ART AT AUCTION The Year at Sotheby's and Parke-Barnett 1967-68: "A diamond ring, by Harry Winston. New York $305,000. From the collection of the late Vera Krupp von Bohlen und Halbach. 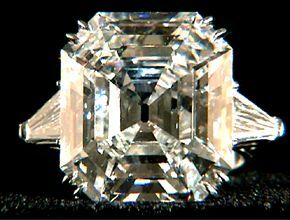 The highest price ever paid [at the time] at auction for a diamond ring."